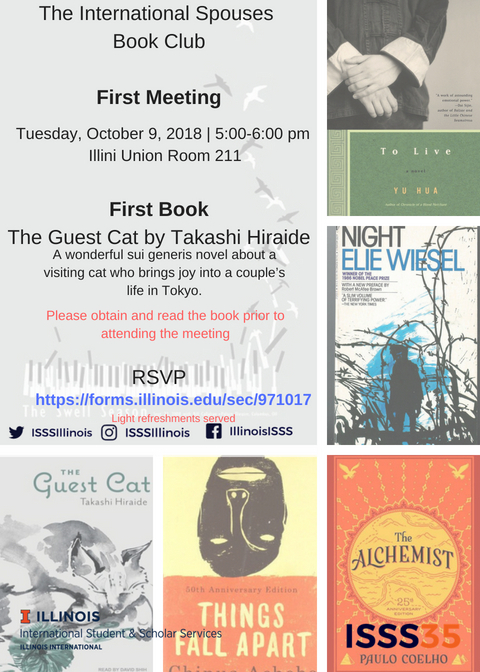 For dates and times of ISSS35 events, please visit the ISSS Events Calendar. Come enjoy FREE ice cream before the movie at the Illini Union! All NEW Undergraduate & Graduate Students are welcome! Would you like to meet new people while enjoying some dessert? Join us at the YMCA Dessert Social! 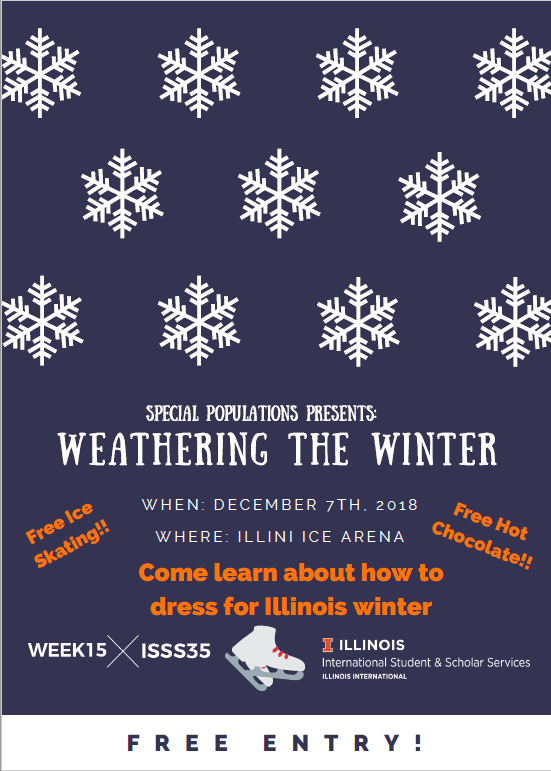 Join us for ice skating at the Ice Arena! 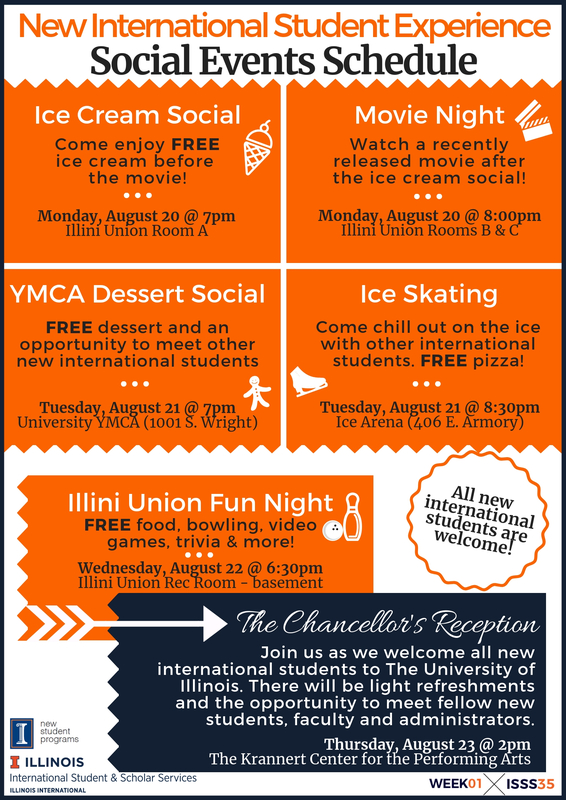 Bowling, arcade games, and a chance to meet other new international students! A welcome event for all new international students with free tours at the Krannert Center! 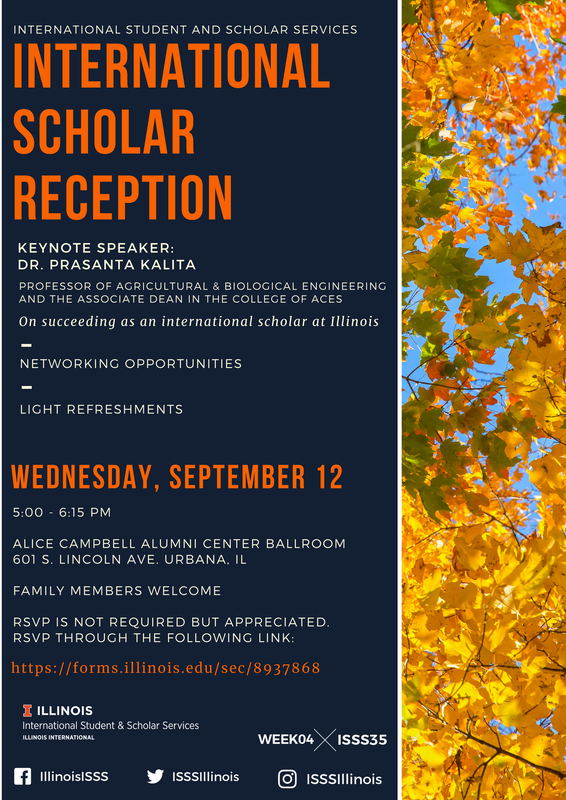 Event to welcome all new and returning outside-J sponsored students. Event to welcome all new IDEA participants. Welcome to all new international scholars to campus! Join us for some Tailgate activities before the UI football game! 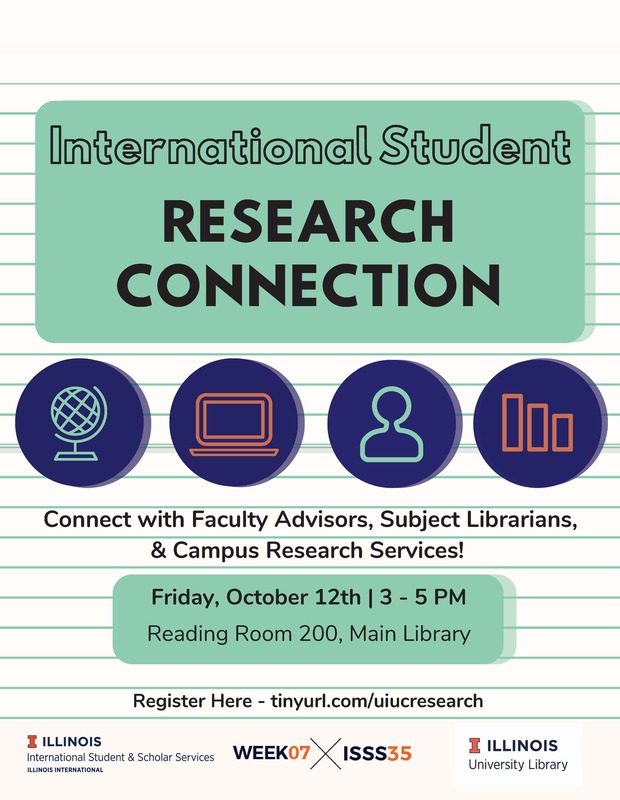 A mix & mingle event, offering an opportunity to network not only with your peers but also with faculty advisors, the Writer’s Workshop regarding thesis/dissertation writing resources, librarians for research/data collection resources/support and the Graduate College regarding grant opportunities. A story is always better if you have someone to share it with. What could be better than sharing it with a group of people who have read it, too?" Every other month read a book from a different cultural background and then we come together and discuss it. ISSS Cooks - Pumpkin Edition! 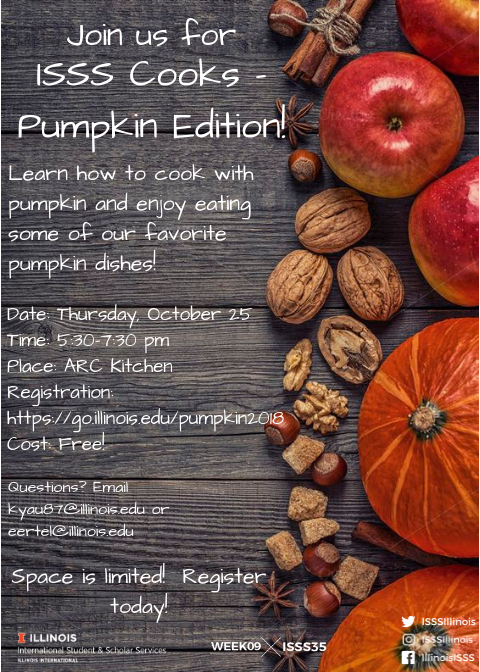 Learn how to cook with pumpkin and enjoy eating some of our favorite pumpkin dishes! 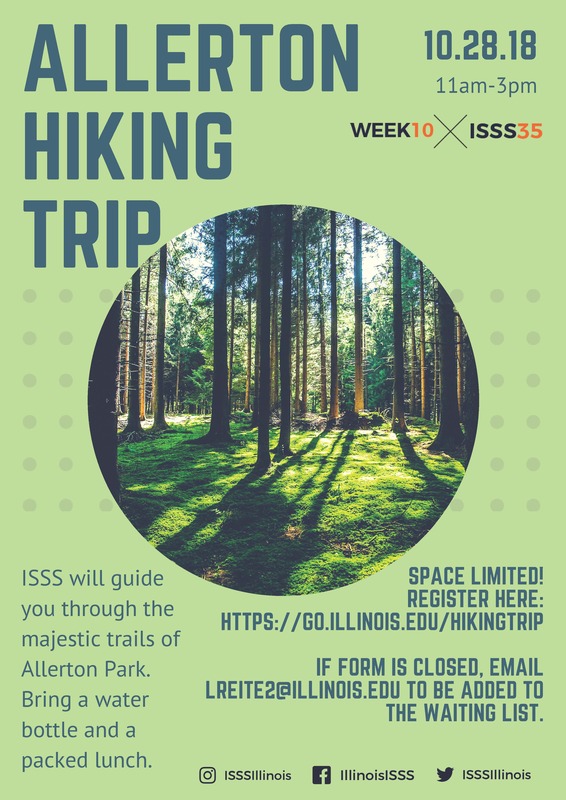 Join us for a majestic trip through the majestic trails of Allerton Park. Enjoy playing soccer? Want to represent your home country? Need a new shirt? 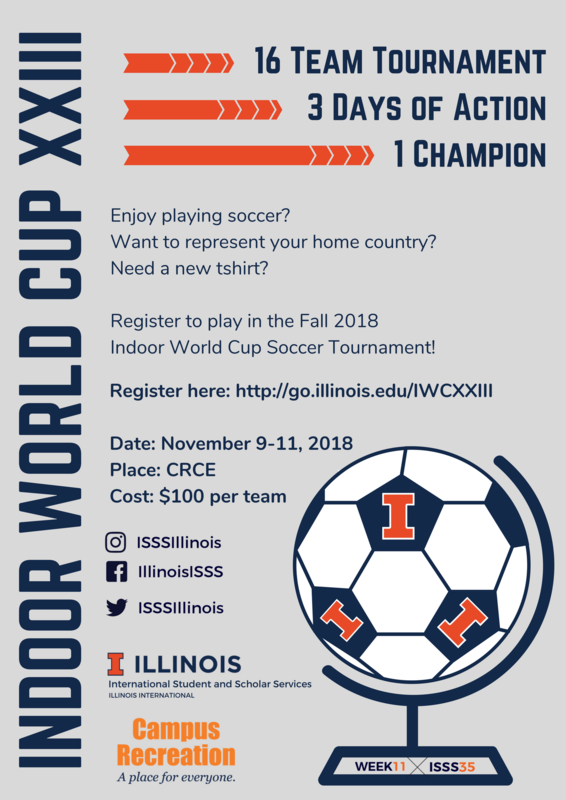 Join us at the Indoor World Cup Soccer Tournament! Winter is coming! Join us to learn more about exciting winter activities and what you'll need to survive the cold weather! Once a month on a Friday night, volunteers gather to form mini lights-out brigades and then tour campus buildings recording how many lights are left on (and shutting off as many as they can, of course). Join fellow students this month as a volunteer, and afterwards, enjoy hot chocolate and tea in your very own complimentary mug! The event begins and ends in the Foreign Languages Building Lobby. No registration required. 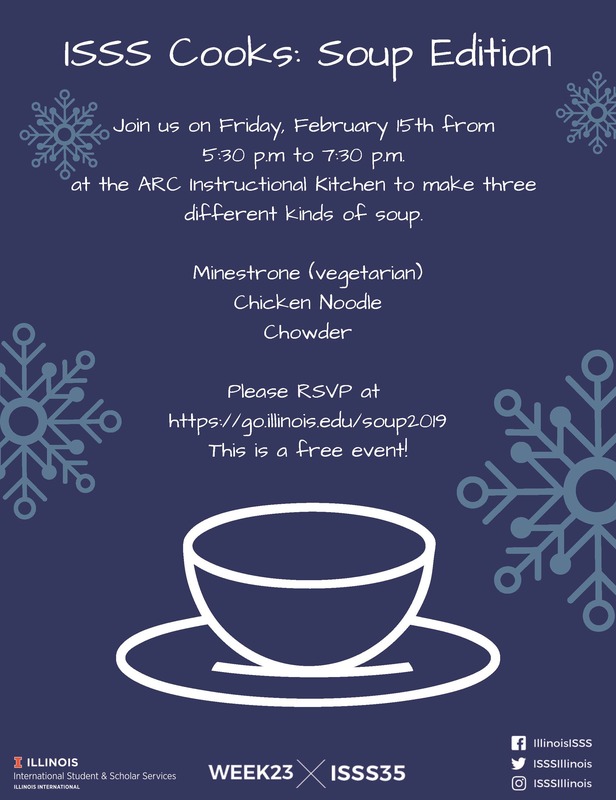 Join us for a free fun night of cooking and sampling three different types of soups! Any level of cooking experience is welcomed! 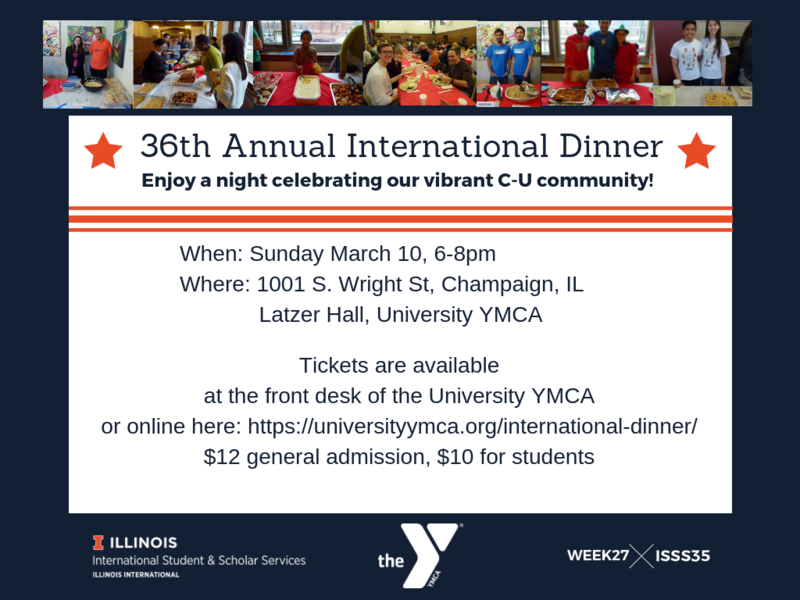 Please join us for a meal and performances at the University YMCA for the 36th Annual International Dinner on March 10, 2019! This annual event provides an opportunity for us to build bridges between people of all ages, backgrounds and cultures. Are you here for Spring Break? 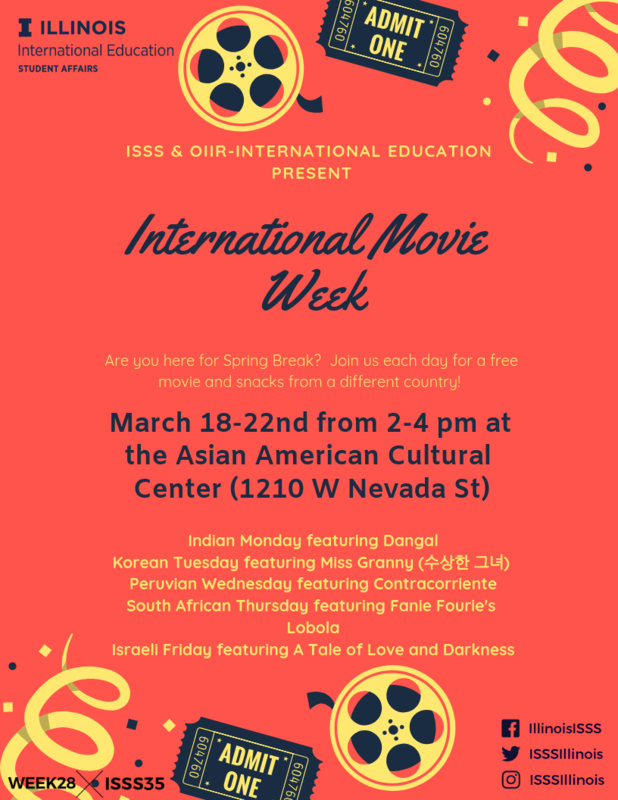 Join us each day for a free movie and snacks from a different country! 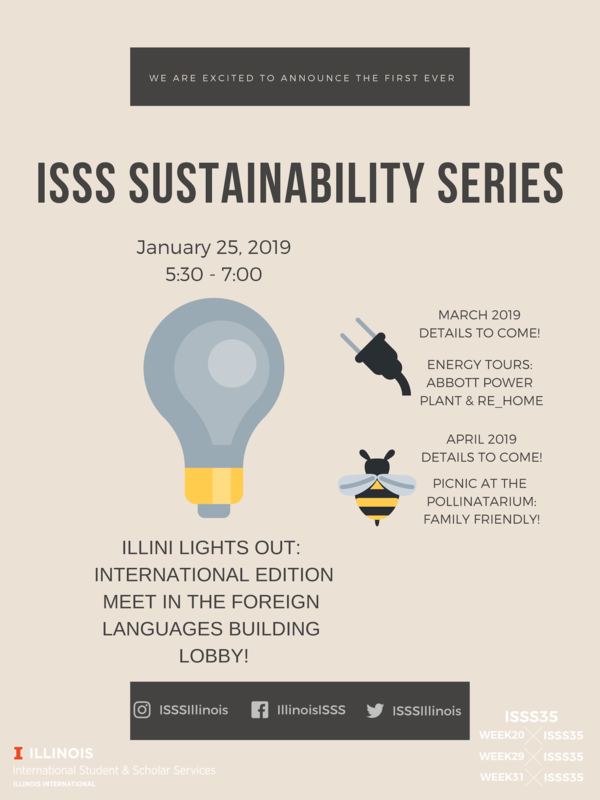 Join ISSS for behind-the-scenes tours of the Abbott Power Plant, which supplies 70-75% of the energy demand for the Urbana campus, and the Re_Home, a UIUC student designed and built family eco-house that can fit on a single trailer and be set up on-site in a day. 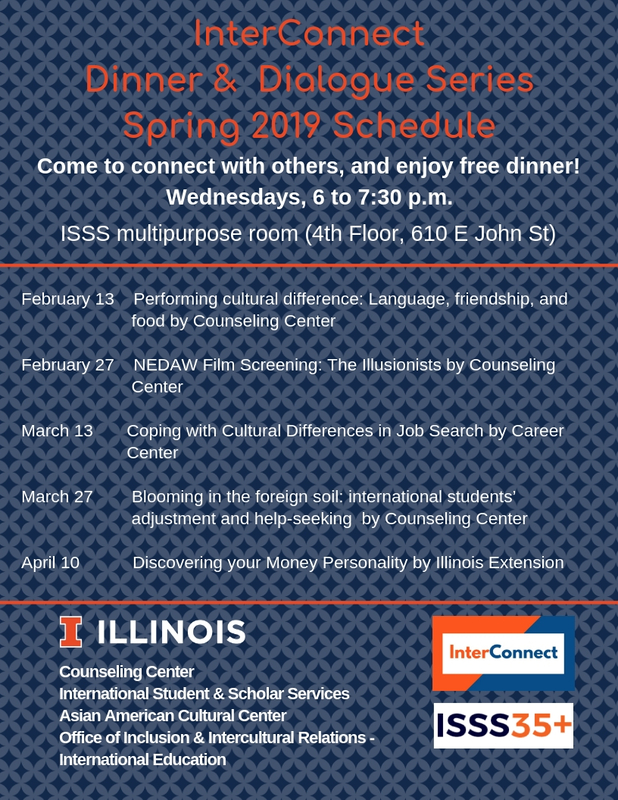 Come see what makes Illinois the first school in the Big Ten to be certified as a Bee Campus USA! The University of Illinois Pollinatarium is the first free-standing science center in the nation devoted to flowering plants and their pollinators. Join ISSS for an afternoon of touring the bee hives, honey tasting, and family-friendly crafts! Snacks, games, and puzzles available throughout the afternoon. 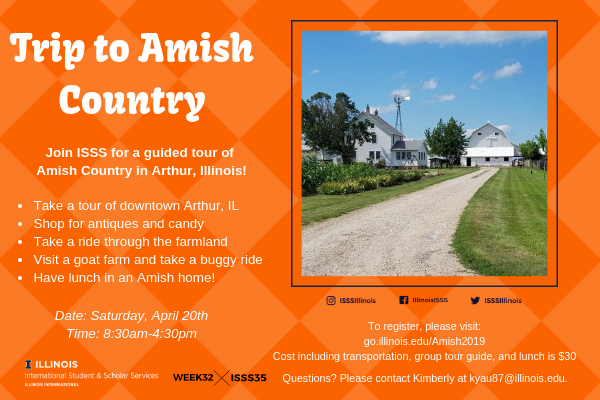 Join ISSS for a visit to Amish country in Arthur, IL! You'll have the opportunity to eat lunch in an Amish home, visit a goat farm, and take a buggy ride! Space is limited. Reserve today!